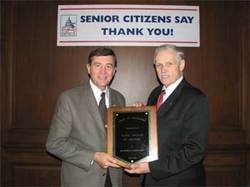 Gutknecht Named "Super Friend of Seniors"
Washington, DC - First District Congressman Gil Gutknecht today received the "Super Friend of Seniors" award from the 60 Plus Association (60 Plus) for his work during the 109th Congress. 60 Plus is a non-partisan seniors' advocacy group with a free enterprise, less government, less taxes approach to seniors' issues. 60 Plus has set ending the "death" tax and saving Social Security for the young as its top priorities. Just what kind of a seniors' group is the 60 plus Association? Read the rest below the fold. More on the 60 Plus Association from the AARP Bulletin and SourceWatch. The 60Plus Association's web site's front page hasn't been updated with much news since April 2006, when the "Seniors' Group Embraces Iraqi Liberation Week." Seems like the media wasn't reporting enough good news. The spectacle of Gutknecht campaigning as an opponent of the drug companies while receiving a "Super Friend of Seniors" award from one of the industry's faux-grassroots front groups provides certain Orwellian pleasures, low-hanging fruit plucked in a DFL press release back in mid-September. The DFL press release concluded with a side glance at the 60 Plus Association's Social Security privatization, and that's where we'll look for our double-plus good newspeak kicks. 60+ has played a role in trying to wipe away the phrase "privatization" in favor of other euphemisms. Even as early as 2002, the group was involved in coalition called Social Security Choice, which urged dropping the word "privatization" in exchange for "modernization." The language and the coalition strategy was repeated in 2005, with the creation of COMPASS, the Coalition for the Modernization and Protection of America's Social Security. Now 60+ tells us it's in favor of "saving Social Security for the young." Ever since the President's plan to begin privatizing Social Security tanked in 2005, the issue has been downplayed. But Josh Marshall pointed out in September that the issue is very much alive, citing an interview with President Bush published by the Wall Street Journal. Here's a report on the potential return after November's electino of efforts to privatize Social Security. Since 19% of the residents of MN-01 collect social Security benefits, this issue affects the district's pocketbooks. Where's Gutknecht, the "Super Friend of Seniors" on this issue? Is he the double-plus good friend the conservative front group supports? Good question. We think he flip-flops like a gigged frog, depending upon the political winds. In 2001, Gutknecht signed a letter written by Ohio Senator Mike Demint to President Bush's Commission on Social Security, urging privatization (see Appendix 3, p. 18). U.S. Congressman Gil Gutknecht says the way people debate Social Security needs to be changed to a non-partisan discussion. He says it will be difficult to reform the program while politicians have what he calls 'heated arguments'. Gutknecht spent an hour talking about the future of Social Security on his weekly radio show. . . .
. . .Gutknecht likes to explain why the current Social Security system is doomed and illustrate the way the program has changed with a chart. Rep. Gil Gutknecht, R-Minn., said during an editorial board meeting with the (Rochester) Post-Bulletin that Bush must overcome a "credibility problem" to revamp Social Security. The congressman said many people think the president underestimated the cost of the Iraqi war, then overestimated the benefits of Medicare's prescription drug plan. "And now, all the sudden, they wonder why people are a bit skeptical of their ... plan on Social Security", he said. "It's partly a credibility problem." Gutknecht also rejected the Bush contention that Social Security is in "crisis." "If I use the word 'bankrupt,' you know, kick me, because I don't think that's a fair term to say about Social Security", the congressman told the newspaper. "It is not in crisis today. I don't use the word 'crisis.'" Democratic Rep. Martin Sabo said that Bush "totally exaggerates and distorts the problem with Social Security." And Democratic Rep. Jim Oberstar said that overstating problems with Social Security is a "recurring theme with Republicans in the White House." "They're not worried about Social Security, about saving it," he said. "They're trying to find ways to dismantle it. So this is a manufactured crisis." Many Democrats doubt that Bush will succeed, but Republican Rep. Gil Gutknecht said that Bush has always benefited from people underestimating him. "I wouldn't bet against him this time," he said. Gutknecht said that Bush presented an "incredibly bold agenda" and did a good job of defining the problems that Social Security faces and presenting a "common sense" solution. But even some Republicans who generally side with the president, and who like the idea of private accounts, are concerned about the tone of Bush's rhetoric. "I think if we mangle this issue, it could clearly cost us the majority in the House. I understand how radioactive this can be," says 1st District Republican Congressman Gil Gutknecht, . . . Whether it's term limits, the Iraq War or Social Security, Gutknecht is an unwavering principled man . . .until the issue threatens his job security. As his slogan implies, Gutknecht is working for what matters most: his own relection.